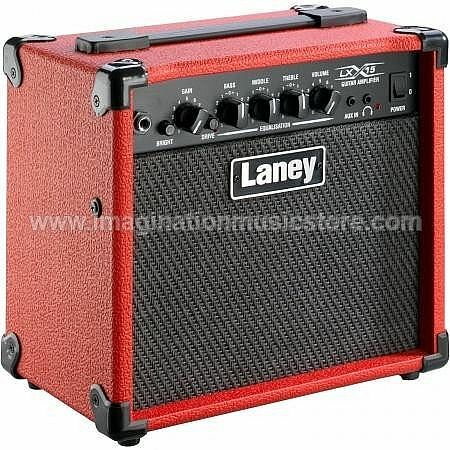 The LX15 is a compact, simple to use practice amplifier delivering great Laney tone for electric guitar. With 15 watts RMS power and twin 5” speakers, the LX15 delivers huge Laney sound and features a classic ‘master volume’ style preamp allowing gain and master level to be balanced independently. With a 3-band EQ tone stack plus a Drive switch to add distortion, an assortment of great tones can be dialled in from spanky clean to overdrive sounds with real punch. The mini-jack AUX input allows for connection of a playback device such as MP3/iPod/CD for jamming along to songs or backing tracks, plus there is a headphone socket – a great feature for private practice or silent late-night sessions. Available in Black, Red and Camo.